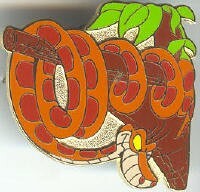 Disney WDW Cast Lanyard Series 2 - Jungle Book (Kaa) This pin is part of the Cast Member Lanyard series. It features Kaa the snake from the Jungle Book. He is wrapped around a tree limb. This picture is courtesy of pin pics. This pin will not come on the original backer card.